Here you can gain insights and pointers into how to use and interpret the Churchill Archive, what archives are and how to make sense of the results you are presented with. What are archives and how do I use them? Archives weren't created to support my essay or research topic so where do I start? How can I interpret archives? How can I get an insight into the feelings of a letter writer? How do I make sense of the results I’m presented with and make the best use of the catalogue? Telegram from WSC to Roosevelt, 20 July 1944, CHAR 20/168/89-90. Telegram from WSC to Stalin, 20 July 1944, CHAR 20/168/94-95. Letter from CSC to WSC, 25 March 1916, CHAR 1/118A/116. Letter from King George VI to WSC, 02 Jun 1944, CHAR 20/136/4. Letter from WSC to King George VI, 03 June 1944, CHAR 20/136/6-8. How do I read the handwritten documents? Archives are ‘primary’ sources. They differ from printed sources (books, journal articles) because they are contemporary with the events described and were created by the people involved. Types of primary sources found in the Churchill Archive include letters, photographs, government documents, military commands. Primary sources are the evidence of what happened. That’s why they are important and why you can add extra depth to your understanding and interpretation of your subject by using them. In the Churchill Archive, you can see battles being fought, wars being won, seismic social change in action and key events in twentieth century history taking place. You can gain insights into the people and personalities involved - not just Churchill himself, but also his family, those who worked for him and many of the key figures of our recent past. First, you should bear in mind that you might not always find what you're looking for; you might find something better! Searching on the site covers the catalogue of the Churchill Papers, keywords and names (people, places etc) as well as the modules and exhibitions on the site. It doesn’t search every word within the original documents or images on the site. 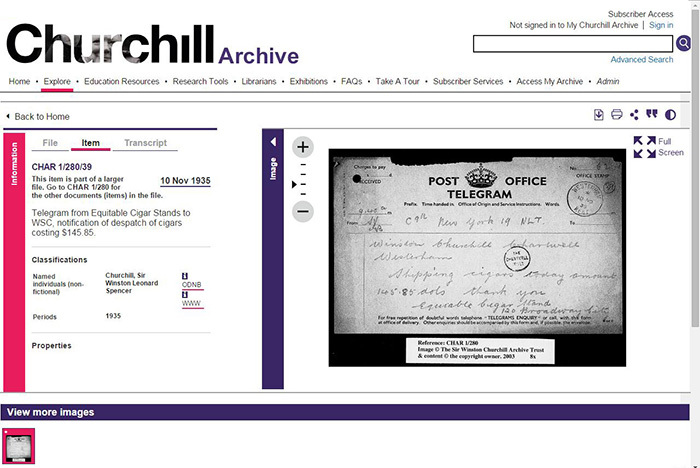 The catalogue contains descriptions of all the papers of Sir Winston Churchill on the Churchill Archive. Those dating from before July 1945 form the Chartwell Trust papers (abbreviated to CHAR in catalogue references), and those of later date form the Churchill Papers (abbreviated to CHUR). 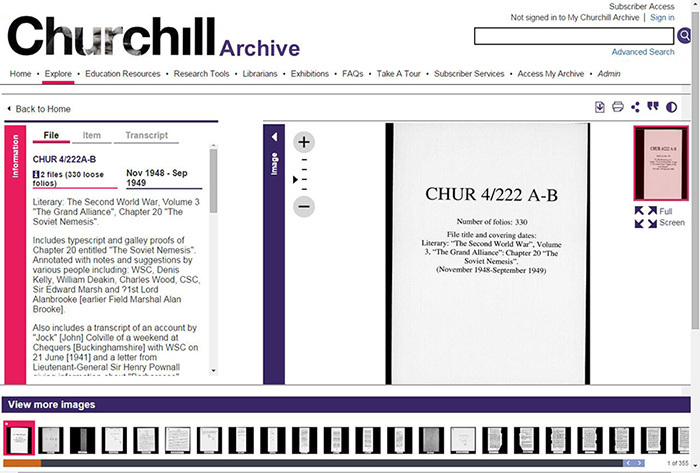 The general term Churchill Papers is used to cover both CHAR and CHUR. Consider the following questions and think about how the answers impact on your research. Is it an instruction (for example, a military command issued by telegram to commanders on the spot)? Was it created to be a record of decisions (eg War Cabinet minutes recording discussions)? Was it created to persuade/influence others or to convey a particular point of view (eg, an article or notes for a speech)? Example 1: CHAR 20/168/89-90: We can see that this business-like telegram from Churchill is explicitly sent to Roosevelt but there is a distribution list at the end. It is also copied to Churchill’s high command. Example 2: CHAR 20/168/94-95: This communication from Churchill to Stalin is copied to many more recipients – to the King and everyone else who mattered. This is a clear indicator of the level of importance Churchill attached to this document. Example 3: CHAR 1/118A/116: There are also many very private documents in the archive, like this fairly early example of a letter from Clemmie to Churchill. She is writing to Winston during World War I. He had resigned from the government after the failure of the Dardanelles expedition and suffered with depression before going on active service on the Western Front, which is where this letter found him. You can see from the content of her letter how preoccupied he is with his future and how carefully she is working to advance his interests back home, as well as how much she longs for time together with him. What stories lie behind this document? What questions does the source answer? What questions does it present to you? Are there other documents related to this that put forward different views? More subtly, you might also like to bear in mind that even while Churchill was engaging with events, he was often thinking about writing about his role in them later. For example, he wrote an enormous history of the Second Word War and there are plenty of examples of his Prime Ministerial missives with vivid prose and clear exposition. Churchill may have had a secondary purpose in mind when he drafted them. For more information on Churchill as a writer and his use of his archive, see David Reynolds' In Command of History: Churchill Fighting and Writing the Second World War and Peter Clarke's Mr. Churchill's Profession: Statesman, Orator, Writer. Was it written at the time of the event, or afterwards? If it's hand-written, how long would it have taken to write it? How was it written - by the author, by their secretary? If it was drafted and re-drafted, what does that tell you about how important it was? Can you tell if it was written in a hurry? Was it scrawled in pencil or carefully written in pen/ink? This will give you a better insight into the feelings of the author - try considering this correspondence between Churchill and King George VI about who gets to go with the armed forces to D Day! Many of the most significant letters in the Churchill Archive have been catalogued in detail, which means that you can find a description of an individual letter. Below is an example. The Churchill Archive comprises a vast collection of papers and it would have taken decades to describe every document in the archive. So lots of Churchill’s post-war papers (catalogue references beginning CHUR) haven't been catalogued down to document level but have been catalogued as whole files of papers. The catalogue still contains rich information about the contents of files, and here’s how to use it effectively. Firstly, look at the number of ‘folios’ (individual pieces of paper) contained in the file. In this example, there are 330 folios. Brace yourself and be patient! It’s going to take time to look through them. In the example below, the catalogue description (in the left hand pane) describes a large file of papers. The list of correspondents is in the same order as the letters in the file. So the first few images are letters from “Jock” Colville (the first name in the list of correspondents). If you see that the correspondent you’re interested in appears in the middle of the list, use the navigation tools to move through the file, checking occasionally to see where you're up to (using the bar along the bottom of the film strip). Bear in mind that many of these big files are arranged alphabetically by correspondent name or subject and labels (name/subject) are often written on the top right hand corner of the copy of the letter sent out from Churchill’s office. Looking at the top right hand corner can also often help work out who letters are from (use the cursor to move the pink square over the document and get the top right hand corner in the screen).